I brought the first of my Cluns home in November 1999. Their inquisitive nature and beauty has endeared them to me and all of their visitors. Here are some of their lambs who have each year increased the flock. Below is a photo of my foundation ram, "Mr. B", who was a very special boy and sure gave me some beautiful lambs each spring! 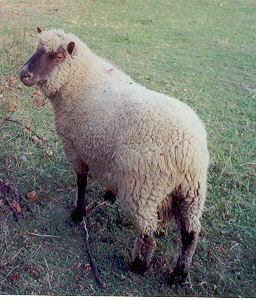 The following description of the Clun Forest Sheep was excerpted (and somewhat paraphrased) from both the Oklahoma State web site and the North American Clun Forest Association's blue book: "The breed takes its name from the ancient market town of Clun, situated in the beautiful Clun Valley in the southwest corner of Shropshire and near the county of Powys. The Clun Forest is a mountainous district, running to an altitude of 1,630 feet above see level. Many Clun flocks have been kept for years in those hills, while others thrive in the lower pastures of the area. Because local shepherds selected for hardy, fertile sheep, the Clun Forest became, through the centuries, a hardy and adaptable breed, able to forage and fend for itself. Some authors attribute the breed to a combination of Hill Radnor and Shropshire with Kerry Hill breeding also introduced in about 1865. Cluns are very alert and responsive, what many breeders identify as "unusually intelligent." The Clun Forest has a long, clean face of dark brown color, free from wrinkles. Ears of short to medium length, set well on top of the head. Bold, bright eyes. Top of head nicely covered; free from dark or black wool."